Explosive rockets are alternate ammunition for the rocket launcher. They have high range and damage which makes them perfect for attacking enemy buildings. The explosion from this type of rocket is much bigger and more powerful than that of a standard rocket. Added small scorch mark from impact of heavy weapons. Updated the explosive rocket icon. Increased the range of the rocket from 20 to 22. 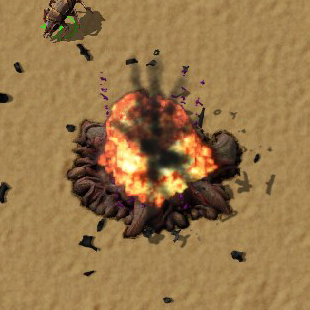 Increased the damage radius of the explosive rocket from 4 to 6. This page was last edited on 6 January 2019, at 05:28.